It’s Sunday night. We’re at a bed and breakfast in Gettysburg, in a building a short distance from the main building, the significance of this being that we don’t have wifi in our room, so we have no internet access. I’m sitting in the main building’s great room, where breakfast is served, with Gail back in our room. I don’t plan to sit here much longer, and so this will be a short report. More when we’re back in Seattle. Just to review, I flew to New York last Monday, arriving in the evening for a short family visit before getting on Amtrak’s 3:00 PM Acela from New York to Washington on Tuesday. We departed 15 minutes late and arrived at DC’s Union Station 15 minutes late, around 6:00 PM. There was a long taxi queue, followed by a taxi ride in traffic. Around 6:45 we had arrived at the Hilton Arlington, in the Ballston neighborhood of Arlington, my home base for the next few days. I was pretty busy through a little after 3:00 Friday afternoon, which also happens to be when Gail landed at Dulles. By a little after 5:00, we were re-united at the Hilton. The work part of my trip was over and our vacation of almost exactly 4 days had begun. We had dinner with a friend that evening at an excellent restaurant around the corner, 1Gen Thai Cuisine. Back in the room, I plotted our route for yesterday. Yesterday morning, our journey began. We checked out, took a cab to National Airport, and picked up our car from Hertz. For a moment, I wasn’t sure the trip would last long, as I couldn’t figure out how to get our 2010 Prius into drive. Once I did, we were off, back to Arlington, where I accidentally got off the highway and found myself at a CVS, a happy mistake because Gail wanted us to stop at one. Once back on the highway, we continued our drive, westward through Falls Church, Wolf Trap, Reston, Leesburg, and assorted other Virginia towns, until we headed north to the Potomac, turned left to parallel the Potomac, crossed into West Virginia, suddenly were driving not along the Potomac but the Shenandoah, crossed over it, and got to the visitors center in Harpers Ferry of Harpers Ferry National Historical Park. It turns out that the visitors center is something of a dummy — a gigantic parking lot and tiny building where you are told to go wait outside for the bus to the real sights. That we were even stopping at Harpers Ferry was a bit of greediness on my part. I couldn’t bear driving to Sharpsburg and Antietam Battlefield without stopping there, it being so close to and being part of the story of the battle at Antietam. But we didn’t have much time to spend there, and the need to take shuttle buses back and forth didn’t help. Plus, it was already close to 90 degrees, sunny, a bit humid, with still air, and we were getting awfully hot awfully fast. Back on the bus, back up the hill to the visitors center, back to the car, onward to Antietam. Time was becoming an issue, because we had a 2:00 appointment for a battlefield tour and it was 12:45. We passed through Shepherdstown, West Virginia, a beautiful town on the Potomac, but didn’t dare park and have lunch at a sit-down restaurant. 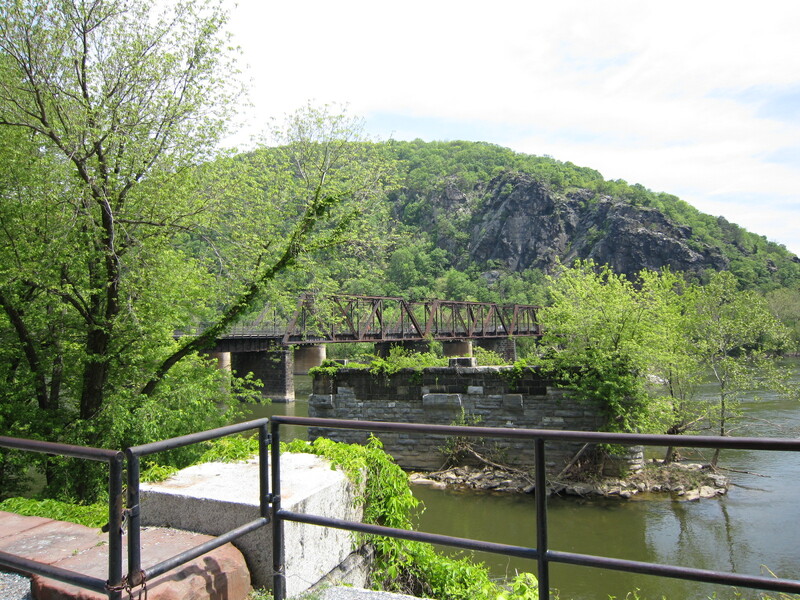 We crossed the Potomac, this time in our car, into Maryland, and onto Sharpsburg, where we saw nowhere suitable to grab a quick sandwich, before turning north to the battlefield. Another mile north and we pulled into the Antietam National Battlefield visitors center. It was 1:20. We confirmed our tour in the museum bookstore, talked to the ranger outside about options, and discovered we could see the 25 minute video at 1:30 or go back to a store we had missed on the battlefield side of town for sandwiches. The center closes at 5:00, when our tour would end, so we wouldn’t be able to see the video afterwards. Video or lunch? We chose video, and went back to the car, where we grabbed the snacks we were clever enough to buy earlier at CVS. Almond M&Ms for Gail, a completely melted Kit Kat bar for me. That would have to do. The video must have been made by Thomas Edison. It was old, the projector was at least as old, the picture jumped, the captioning kept jumping around and was way too close to the middle of the screen. Amazing story, to be sure, but the video quality was a continuing distraction. It did serve as a good warmup for our tour. We met our guide at 2:00, went outside and around back of the center to a rise where we could get a good overview of the battlefield and the region, framed by mountains in the distance. Thus began 3 1/4 hours of fabulously engrossing touring. I wouldn’t even know where to begin. Maybe in another post. 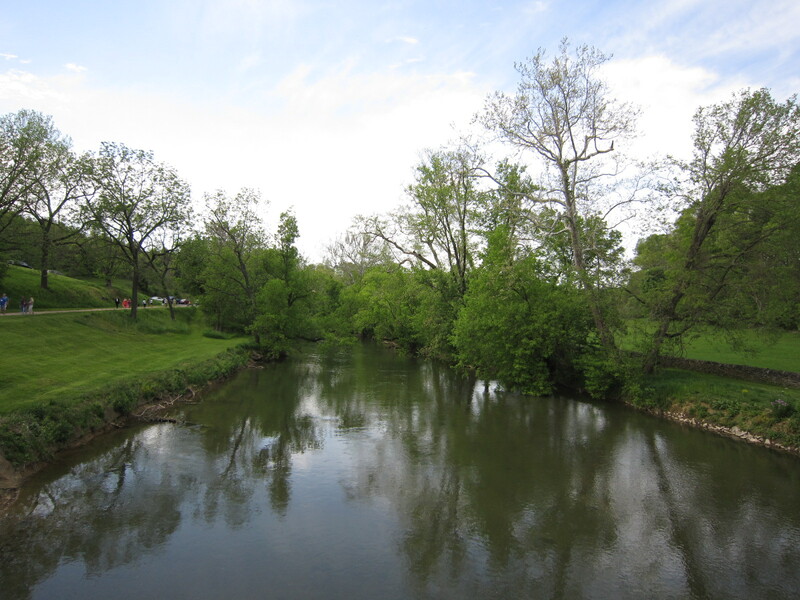 For now, you can look at the view of Antietam Creek, below, from Burnside Bridge. Let me jump ahead. We parted ways with our wonderful guide around 5:30 and headed north toward Hagerstown, Maryland. Within 5 miles there was a gas station convenience store, where we got sandwiches and cold water. Then we zigzagged east and north and east and north to Gettysburg, the highlight of the drive being the passage through the Catoctin Mountains and Cunningham Falls State Park. We exited into Thurmont, Maryland, where we got onto US-15 just before entering downtown and headed north to Gettysburg, just 15 miles up the road. Dinner in town, drive around, get back to the Inn. Great breakfast this morning at the Inn. Meet up at 10:00 AM today with our guide Ellen from the Association of Licensed Battlefield Guides. Drive around the battlefield with her for just under 3 hours. Learn a lot, see so much. Amazing place. Go to visitor’s center, which opened just two falls ago. See a massive group of kids in line for the 1:45 showing of the movie. Delay 15 minutes and see the 2:00 showing. Exit (as one must) into the famous cyclorama upstairs. See it. Come down the stairs, enter museum around 2:45, leave around 5:15. So much to read, so many good videos, so many artifacts. Just a great place. Back to town for dinner. Drive around town, then out to battlefield, drive around battlefield between around 8:30 and 8:45 as the last light disappears, in rain and humidity with moisture on road vaporizing and rising up into a fog in front of the headlights. Sit here and type this. Tomorrow we want to walk around in the center of town, which we haven’t done yet, and revisit some key battlefield sites. Then we’ll drive to DC, check in, unload our car, and have the evening to wander around. It occurred to me when we got in tonight that a great way to conclude our Civil War visit is to go to Ford’s Theater Tuesday morning. We could then return to the hotel, pack up, check out, go to Dulles and fly home. Since there’s no wifi in the room, I wasted 15 minutes looking into getting reservations for a tour time on my iPhone. It was stupid. I finally came in here to the main building to do it on the computer. We will go at 10:00 AM on Tuesday. We went to the theater in 1996 as part of the big trip we took by train across the country with Joel. It must have been in the high 90s that day. We saw the White House, then Ford’s Theater, then took the train up to Baltimore, checked into our hotel — with a view into Camden Yards — walked in the painful heat and humidity to the Inner Harbor, then back to the hotel, then to Camden Yards to get dinner and watch the Mariners play the Orioles. Pretty great day. I might not have thought to go again, but I remembered that it was renovated and re-opened to great fanfare last year — February 12, 2009, the bicentennial of Lincoln’s birth. Thus it’s surely worth a return visit. And seeing it is such a natural way to conclude our trip.